You may have the acumen of a seasoned pro and the patience of a chopping block. Guess what the recruiter’s response time is going to be. And the last thing you want is to wait that long to get the job. You should be worried no more. Because you’re about to learn how to make a kickass customer service resume. One that will make your phone ring like crazy. A customer service resume sample better than 9 out of 10 other resumes. How to write a customer service representative resume that will land you more interviews. Tips and examples of how to put skills and achievements on a customer service representative resume. How to prepare the best customer service job description for a resume to get any job you want. Customer Service Resume Template- See more templates and create your resume here. What’s the Best Format for a Customer Service Resume? You must earn 6 seconds of their attention. This is how little time they’ll spend scanning your resume for customer service. If you want to be sure you make a great impression, go for the chronological resume format. It highlights your experience and key achievements, for one thing. It’s perfectly scannable and navigable, for another. If you’re a career changer, you might want to take a peek at what the functional resume format looks like. Embrace white space. It gives your resume a clean and well-organized look. Write simple headings. They will help the recruiter find the information they’re looking for. If you want to be 100% sure your CSR resume keeps its shape on all devices and operating systems, save it as a PDF file. You’re ready to write the first section of your customer service resume. Still fuzzy about the best format for your customer service resume? Here’s a resume writing guide that will clear things up: Best Resume Format: Which to Choose? Customer Service Resume Objective or Summary? It sets the tone for whatever happens next. This is why you must prove to the recruiter you’re worthy of their attention right off the bat. Start your resume with a smashing opening statement. Before you learn how to nail your resume objective or summary, let's clear things up a bit. Resume objective for customer service highlights your skills and explains why you’re a perfect fit. The opening statement of this kind works best for candidates with limited work experience. Customer service summary for a resume is a brief… summary of your relevant professional experience and key achievements. It’s perfect for candidates with previous experience in customer service. Passionate and detail-oriented student working towards obtaining a BA in English from UCLA (GPA 3.8.) Trained in conflict resolution and communication. Eager to join CCS Inc. to build customer loyalty by leveraging interpersonal skills and offering top customer service. Previous 3-month internship experience in a CSR role at a tech company. An English student who’d love to join your company to gain experience and develop professional skills as a customer service representative. These two resume headline examples for customer service differ substantially. They start their customer service objective with strong character traits. Refer to the employer by name, and specify how they can help and what they can offer. Well, this is what smile-inducing resume objectives for customer service look like. The wrong customer service resume example reads like a generic description copy-pasted from a random website. Not to mention it’s all about taking, not giving. Engaging and patient customer service professional with 12+ years of experience responding to all types of customer inquiries. Eager to join ExxCom to grow customer loyalty and maintain the highest level of customer service. In previous roles maintained customer retention rate 45% above company average and received 99% positive customer survey results. Experienced customer service professional with substantial experience in the CS area. Seeks new challenges, and would love to join ExCom to keep developing professionally. The differences between these two resume summary examples for customer service are striking. Start off with your strong traits. Show how much experience you have. Say why you want to join the company. Put numbers wherever you can. Remember: numbers speak louder than words. Now look back at the wrong example of the customer service summary for a resume. It doesn’t say much, does it? You don’t want your resume summary for customer service to stay mum. For the other 249 candidates who have applied. Describe your customer service experience on a resume so it shows you have it all. Find a customer service job that’s in line with your qualifications and experience level. Opens customer accounts by recording and verifying account information. Cancel or upgrade account information. Place or cancel orders from direct customers, distributors and agents. Resolves product issues (customer complaints) by clarifying the customer's complaint; determining the cause of the problem; selecting and explaining the best solution to solve the problem; expediting correction or adjustment; following up to ensure resolution. May compile/provide reports on overall customer satisfaction. For your convenience, the yellow highlights point at the skills the recruiter (and the ATS) will be looking for on your customer service representative resume. At this point, you probably know what you need to do. You must tailor your resume to the job offer. Answered product and service questions and offered information on related products and services. Boosted new customer NPS scores by 10%. Placed and canceled an average of 200+ orders from customers, distributors, and agents a week. Prepared monthly reports on customer satisfaction. Received Associate of the Month Award 3 times. Helped to resolve a recurring product complaint by analyzing reports and identifying a major process bottleneck which led to a 70% reduction in the number of tickets for this specific issue. Maintained customer retention rate 40% above the company average. Take a good look at the right customer service resume example. That’s how a job-winning customer service job description looks. 98% of Fortune 500 Companies use the so-called Applicant Tracking System (ATS) software to streamline their recruitment processes. The ATS scans resumes for customer service for keywords. The ones you can find in the original job posting. If the ATS is unable to find the keywords, your resume won’t pass the scanning stage. That’s the reason why your job description section must use the customer service resume keywords you can find in the job ad. After the ATS scan, your resume will go to a human recruiter. If they see you only copy-pasted the phrases from the job listing, they’ll give your resume a miss. Your customer representative resume must make an impression on the recruiter as well. Present your achievements, not responsibilities. The difference? Achievements show how well you’re able to carry out your responsibilities. They’re your responsibilities proven with numbers. By listing them in a dedicated key achievements subsection. Just take another look at the customer service representative description for a resume above. Pro Tip: If you’re writing a career change resume and want to describe your customer service experience, you can follow exactly the same rules. Remember: relevance is key. What about a customer service representative resume with no experience? Never leave the experience section empty. How do you put customer service skills description on a resume if you’ve got no experience? Almost all entry-level customer service jobs require you to have great communication, interpersonal, problem-solving, and soft skills. The rest you can learn on the job. The key is to show your best side on the resume. So, take some time to brainstorm any kind of public interaction you’ve engaged in. Pick the items that best fit the job description: perhaps you have experience in data entry? Maybe you're familiar with Zendesk? Make sure you include everything you've done related to customer service on your resume. Not sure how to do it? Here’s our step-by-step guide on how to write the first resume with no work experience. Maybe you’ve had internship experience where you’ve helped someone deal with a problem? Your entry-level customer service resume isn’t about listing all the things you’ve ever done. It’s about highlighting your relevant experience. How to increase the recruiter’s CSAT score by 200 percent? By showing them you’ve got all the customer service skills they’re looking for. And then some more! If you’ve done your job description right, you’ve already included quite a number of relevant skills. Placed and canceled an average of 200+ orders from customers, distributors, and agents a week in a timely manner. All the skills the hiring manager is seeking are part and parcel of your customer service representative resume job description. They’re all put in the context of your achievements, which makes them twice as impressive. If you based your customer service job description on the job ad, this is exactly what you get! But we can take it a step further. Give your customer service skills more prominence by listing them in a separate key skills section on your resume of a customer service representative. At this point, you may want to cast another glance at the job listing. See if there are any customer service resume skills you possess, but which you haven’t been able to work into your experience section. If you find any, just add them to the list. Pro Tip: Don’t go overboard with your skills. List up to 10 and pick the ones you’re really good at. This way you’ll not fall victim to the so-called presenter’s paradox. Make sure you sprinkle your relevant skills throughout your entire customer service resume. Put them in your customer service resume objective, job description, and key skills sections. Even if you happen to forget to include the education section at all. More and more customer service representative positions require you to be educated. Minimum High School Diploma. Preferred qualification is some college with a technical discipline. Don’t neglect the education section on your customer service representative resume. Don’t just list the school name. Participated in the community outreach drive 2015-2016. Led a fundraiser for the local Green Team 2016. As you become more and more experienced, the recruiters will naturally start to pay more attention to your achievements. That’s why in your customer service manager resume you can stick to listing graduation date, school name, and degree earned. Pro Tip: Let’s say you didn’t finish your college degree. You can still add your credits to your resume. Just add a line: “Obtained 90 credits toward a BA in Psychology.” Haven't started college? Put your high school degree on a resume. How About a Customer Service Resume Cover Letter? Writing a cover letter feels like working with a rotary dial phone and an abacus. A well-written cover letter proves your communication skills. It’s a chance for you to fill in all the blank spots on your customer service representative resume. It introduces the person behind the achievements. Keep it short and to-the-point. Tell the story behind your customer service resume. Write it clearly and keep it well organized. That’s until you get down to writing it. Your mind is very likely to go blank. Our comprehensive guide on how to write a perfect cover letter in 8 simple steps will surely help you out. Writing a customer service representative resume is something more than dumping all your skills into a good looking customer service resume template. Start with a snappy customer service resume objective or summary. Create a compelling customer service representative job description for your resume. 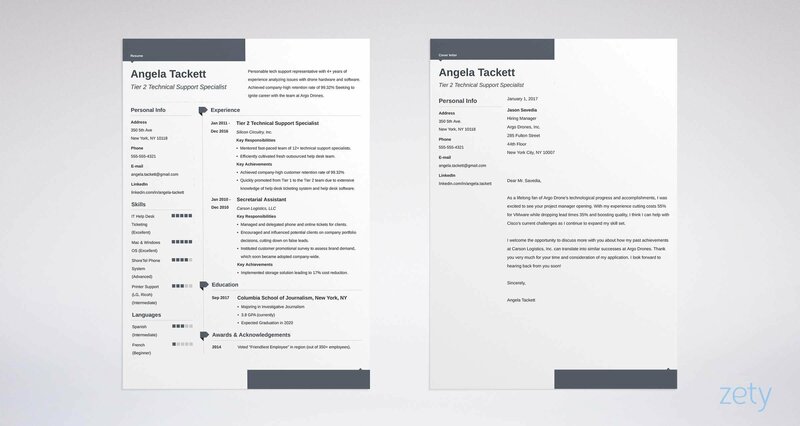 Choose an elegant format for your customer service resume. Attach a customer service resume cover letter to show your prospective employer what you’ve got to offer. Are you writing a call center customer service resume? Or perhaps you’re a seasoned CS professional eager to help the rookies out? We’d love to hear from you, leave your comment below!